NOTE: The listed coordinates are NOT the position of the cache. Updated description as of 9/26/2010. Thanks to Haicoole for allowing me to adopt this cache. I've reviewed the descriptions for the DeLorme challenges nearby and have attempted to have some consistency with the rules of those challenges. "Yes that was the sound of a gauntlet being thrown. This cache is for all of you mega-cachers, you 500+ finders, you 'I am not addicted' folks. October 2002, SageFox showed me my first DeLorme map. I fell in love (with the map, although SageFox is a really nice guy, I suspect his wife would not approve.) Half way between a topo sheet and a road map, it is a permanent fixture in my van, right between me and Austin the Cache Hound." Goal: To find a cache on each page (page 22 through page 125, 104 pages in all) in the Northern California DeLorme Atlas & Gazetteer, have those finds verified, and find the FINAL cache to claim credit for a find on this one. Basis: This challenge is based on the Northern California DeLorme Atlas & Gazetteer book. The northern part of California is divided into sections with each section number being a page number which contains the map to that area. 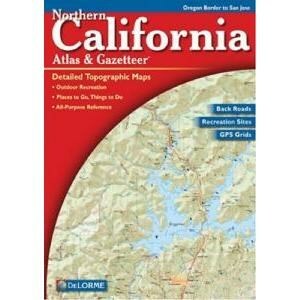 The Northern California one is now out of print as it was replaced by the California DeLorme Atlas & Gazetteer (that one won’t work for this challenge, but you may want to check out the Golden State DeLorme Challenge as it is on my list of challenges to complete). Anyway, you can search the internet and find used versions that will do. You do not have to buy a DeLorme atlas to complete this cache, but it may help. 1. The coordinates posted on this page are not the coordinates for the final cache. I am leaving them the same as when I adopted the cache. I think it’s a great touch to have it almost dead center of the Lawrence Livermore National Laboratory. For reference and trip planning purposes, the final cache is on Page 105. 2. Generally accepted rules, guidelines and conditions for logging a find apply. These must be bona fide caches that you have personally (physically) found and logged. You may include caches found prior to the creation of the Northern California DeLorme Challenge, as long as they meet all other Challenge requirements. 4. Cache types that DO qualify as finds for this challenge are: Traditional, Multi, Virtual, Letterbox Hybrid, Unknown, Groundspeak HQ, Project APE, Webcam, Earthcache, GPS Adventures Exhibit, and Wherigo. Multis and Puzzles have the additional qualification in that the initial geocaching.com waypoint must be in California (conceivably the final could end in another state). 5. Cache types that DO NOT qualify as finds for this challenge are: Event, Cache In Trash Out Event, Mega-Event, Lost and Found Event, Groundspeak Lost and Found Celebration, (OK, all event types), Locationless (Reverse), and NGS Benchmarks. 6. The cache coordinates must be in California and the north coordinate must be N37 00.000 or greater. In other words, Caches outside of California or north coordinates are less than N37 00.000 do not qualify. In addition, Multis and Puzzles will only have their initial (or starting) geocaching.com waypoint validated for qualification. It is conceivable that a cache can start on one page and end on another. 7. While I’m pretty sure that the various editions and versions of the Northern California DeLorme Atlas & Gazetteer haven’t changed much (at least in terms of the page boundaries). I, as the cache owner (CO), owns a copy of the Fifth Edition (Copyright 2000) and it will be considered definitive as to coordinates for the page boundaries. Page 103 has two different areas shown, what I refer as Pages 103a and 103b. Page 103a is the area with most of the page (including the Pacific Ocean) and contains land near Bolinas Bay to the north. Page 103b is the small triangular area that contains the California-Nevada border. A find in either 103a or 103b satisfies the requirement for Page 103. Page 114 has two different areas shown, what I refer as Pages 114a and 114b. Page 114a is the area with most of the page (including the Pacific Ocean) and contains Half Moon Bay to the north and Davenport Landing to the south. Page 114b is the triangular area that contains the California-Nevada border. A find in either 114a or 114b satisfies the requirement for Page 114. 9. When in doubt, ask - we can discuss it, but the final decision rests with the Cache Owner. 1. Run the project-gc checker for California DeLorme Challenge (Northern) which is the easiest and quickest way for me (and you) to validate whether or not you fulfill the requirements. For options 2 - 5, send me an email with a list of candidate caches. 2. A public shared bookmark list. 3. A GPX format file. 4. A LOC format file. 5. A TXT file containing the cache name, GC code, and coordinates (keep in mind, this is the slowest way for me to validate the list). The Final: Once I’ve verified your list, I'll provided you with the coordinates and special instructions on how to access the cache so you can sign the physical log. 1. All finds prior to KCSearcher's adoption of the cache on 8/10/2010 are considered valid and have been "grandfathered" as legtimate (thanks to MotorBug for the suggestion). 2. All finders prior to 8/10/2010 wanting to sign a physical log can request the coordinates to the final by sending me an email. 3. A good way to keep track of your progress is to create a public shared bookmark list of the caches you want to use to verify the candidate list. 4. Constructive feedback is always welcome. Again, many thanks go out to Haicoole for the original idea for this cache. Thanks to Arizona Ranger Team for idea of this download area. And thanks to all of the other cache owners who have taken the idea and run with it for their own states. project-gc checker A Project Geocaching challenge checker specifically to check progress as you attempt to complete the California DeLorme Challenge (Northern). I will accept the results of this checker as proof that you have competed the requirements. Once that's done, I'll send you the coordinates for the final and an opportunity for a hosted meal by the CO (that would be me). DeLorme Page Tool Given coordinates, a tool to show the related Northern California DeLorme Atlas & Gazetteer page number. NCalDeLormeGrids.jpg A jpeg image file showing the 2000 numbering of all the Northern California DeLorme Atlas grids. This is the one that counts. NCalDeLormeGrids.txt A text file containing the page boundary definitions in Decimal Degrees as well as Degrees, Decimal Minutes for the Northern California DeLorme Atlas grids. NCalDeLormeGrids.kmz A Google Earth overlay file to show the boundaries of the Northern California DeLorme Atlas pages. Challenge.gsk A GSAK macro to analyze your finds, produce a list of qualifying finds, show what grids you still need, and will show it all on Google Earth. See Rule 7 for special notes regarding Pages 103 and 114. Remember, you only need to find a cache on pages 22 through 125 (104 pages in all). Thanks to Hynr for adjusting the D_NorCal,GCHANH,California Delorme Challenge (Northern) option to meet the Cache Owner's page boundary requirements. As of 2017-11-29, I have certified Version 2.79j and will use it to validate your list. As each new macro version is published, I will check each and post an appropriate note here. The final is on Page 105.